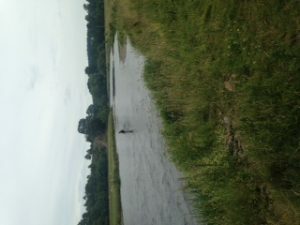 Fishing for fish on the River Eden? Not likely, just for fun. What do you think of, when you think of the Lake District? – fells, walking, lush greenery, lakes, becks, ghylls, rivers, water, sailing, rain of course. However for some, fishing is the thing: for it is not a sport, a hobby, a profession or a pastime, it is an obsssion. My husband falls in to the “incompetent, amateur novice”, but still he thought he would give it a go. An old friend wanted time to de stress from a frantic work life in London so he whizzed up on the train to Penrith. It was an easy trip, just about three and a half hours. He took a taxi from work to Paddington, then he realised he needed to be at Euston. He caught a later train, but the outcome was the same, he arrived in time for a relaxing weekend. The sun was shining bright and full on Friday, but by Saturday, in true Cumbrian spirit, the clouds had steamed in to create a muggy and overcast day. However the intrepid fisher folk said that would be better because who wants to be wrapped up in rubber (waders) on a hot day? They went to a place on the Eden, so technically a bit outside the National Park. My grandmother would probably have said they were venturing into foreign territory, but this is nothing to a grown man who gets confused as to which train station will take him to the wilds of northern England. They could have paid for a gilly, but where is the fun in that, they might have caught some fish? They had much to contend with, the weather, the river’s flow and picking the right fly from a delectable selection of 300. Yes they had all the right equipment, but alas no luck or…is that skill? To be fair, although what wife wants to be fair after 25 years together, they did catch one fish each, so they said. There is no incontrovertible proof of this, but I think I believe them. Besides they had a great time, letting the stresses and strains wash away as they cast and dreamed some dreams whilst admiring the beautiful river Eden. In short a wonderful day was had by both. I asked them what they had discussed over 9 hours, they agreed: nothing. So I would conclude it was just about perfect. P.S. The more astute reader or probably just about everyone will see my husband’s photo is not the right way up. That is because his wife is an “incompetent, amateur novice” blogger- touché Alan.